This is an impressive little book. Besides a detailed 13-page introduction about plants and pollinators, which ought to answer the questions of most people about pollination – its biology, evolution, importance, rewards and risks – the following 200+ pages are devoted to the 100 plants in the title. They are divided into native wildflowers (43), native trees and shrubs (32), introduced trees and shrubs (2), introduced herbs and ornamentals (12), and native and non-native bee pasture plants (11). The book is intended for use throughout North America and each plant is accompanied by a map showing it’s native range. A list of the plant’s uses is also provided and is very helpful as anyone tending to the needs of pollinators is likely also attuned to other benefits of plants such as reclaiming land, restoring wetlands, providing hedgerows, hosting butterflies, providing nutrition or herbal medicines, or simply looking beautiful. To help those focusing primarily on pollination, however, the book usually lists a plant’s flowering seasonality, the percentage of sugar in the nectar, re-ports of honey production based on it (in pounds), the type of location it prefers, and numerous other facts of interest to anyone keeping bees or trying to encourage more pollination of crops. I should not neglect the beauty of this book. Every page is in full color, most with lovely examples of the flowers of the cited plants. Anyone considering planting for pollinators will treasure this small but well thought-out resource. 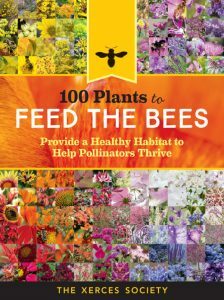 It provides a wealth of information to guide decisions for helping pollinators thrive as well as increasing the beauty and resilience of any natural habitat. I can’t imagine a better booklet to take along on an excursion with your child to a garden, meadow, or woodland. Just make sure you read it ahead of time so you can answer all the questions that will come up when you see bees or other pollinators at work!